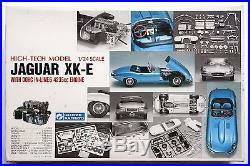 Gunze 1/24 High-Tech Model Jaguar XK-E. This model was produced in 1980-90's. One of the top quality detailed scale model kit, and no more possibility to reproduction! You will be able to find more easily the item you are searching for, using "Categories" in my store. 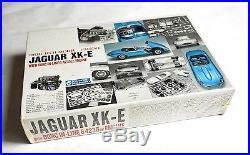 1/24 Jaguar XK-E with engine parts multi-material scale model kit. The Jaguar XK-E (E type) is the definitive sports car provided in England, reflecting the classic desire for open-top sport racing. Its beautiful body styling, up-dated performance and techniques come from the earlier "C" and "D" types, which raced at the circuits in the 1950s. Type E attracted attention of the world, due to its beautiful streamline and high performance, as well as its low price. The model produced 1961 to 1975. 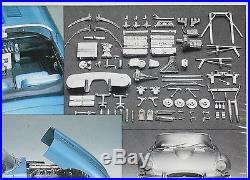 This model kit is the authentic replica of the "E type series 1", 1964 version with 4.2 L straight 6 engine. Not only the engine, but also the mounting and radiator are in full detail made with cast white metal. The spoke wheels consist of photo etched parts in piles. Kit Condition : U n-opened stock / please check attached photos. 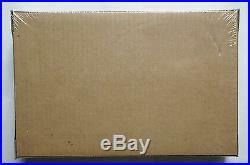 Box : Unopened, shrinked by plastics. There are some dents and dirt spots on the box. Unable to check the contents. Assembly instructions : Japanese & English Decal : Unopened. Size (Box) : 29.0 X 19.0 X 6.0 cm Weight (Box) : 490 g. Please pay within 3 days after. East Asia / Southeast Asia. North America Central America Middle East AU, NZ. Small Packet SAL / Economy. Some country such as Australia, Denmark, Germany, Norway, Hungary, Finland, and Poland stopped to accept SAL parcel since Jan 2014. About "The polarbear stable" shop. We are based in Tokyo, Japan. We just launched our e-Bay store in Feb, 2013. We deal mainly Scale kits of Cars, Gundam and etc.
" with heart of "Hobby for elder boys. We are working hard to increase the number of items listed, as well as improve the quality of the items! I hope you share the same enthusiasm with us! International Buyers - Please Note. The item "GUNZE High-tech model 1/24 Jaguar XK-E with engine parts scale model kit sealed" is in sale since Monday, March 13, 2017. This item is in the category "Toys & Hobbies\Models & Kits\Automotive\Sports\1/24 Scale". The seller is "thepolarbearstable2012" and is located in Tokyo.